The construction on Pacific Avenue continues. To their credit, the city has placed banners and signs saying that businesses are open during construction. A couple weeks ago I got to the corner of South 10th and Pacific. A construction worker asked me where I was heading. I told her I wanted to go to Poison Apple. She radioed someone and instructed me to walk down a pathway in the street made by barriers. Once I got to the front of Poison Apple, another construction worker let me walk through the area and enter the business. Like other Pacific Avenue businesses, Jooley’s business has been hurt by the construction. Her shop is exactly the sort of place that people walk into because they’re passing by and right now that sort of thing is nearly impossible. 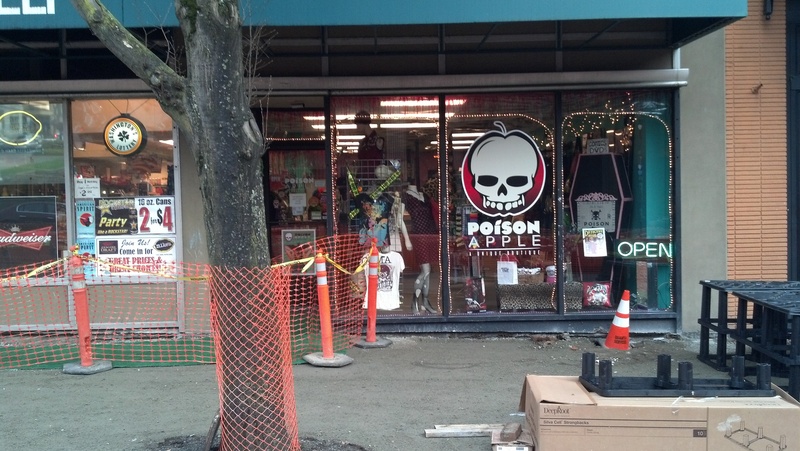 With no window shoppers, Poison Apple sometimes has days where there are only a handful of customers. Luckily, Jooley is every bit as imaginative when it comes to running her business as she is at getting interesting items to sell. You’ll find Jooley setting up vending booths at various local events whenever she gets the chance. This is the way many first time customers discover her. She’s also just put up a new Poison Apple website. Now you can purchase the oddities found at Poison Apple even if you’re not local. Poison Apple is a one of a kind store and the sort of place that makes Tacoma such a great place to live. If you’re in the neighborhood, stop by and say hello to Jooley. You’re sure to find something that strikes your fancy. This entry was posted in Surviving Pacific, Tacoma Places, Tacoma stuff and tagged Jooley Heaps, Pacific Ave Construction, Poison Apple, Poison Apple Tacoma, Tacoma. Bookmark the permalink.